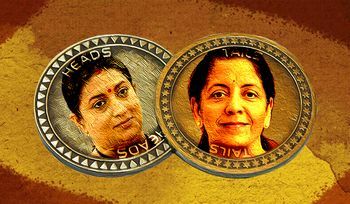 Who will be the feminine face of the BJP in the next Lok Sabha? The party is debating the question as Sushma Swaraj, who was party’s frontbencher for long, announced her retirement from electoral politics. The external affairs minister has said that her health does not permit her to represent a Lok Sabha constituency, which demands hectic attention. The party is likely to accommodate her in the Rajya Sabha, in view of her debating skills and administrative abilities. Another party stalwart who is not contesting the elections is Uma Bharti, the Union minister for drinking water and sanitation. Though she is more known for her public speeches than for parliamentary performance, her experience in Parliament will be missed. That leaves only Lok Sabha Speaker Sumitra Mahajan, who has been in Lok Sabha for eight terms. The Indore MP has indicated that she would like to contest another election, but she has been known more as an amiable person, too mild to engage in political confrontation. That is why the party is looking for newer faces who have strong experience in debating and can go for the political kill. From those in the Rajya Sabha, two names are doing the rounds. They could be picked to fight the general elections, so that they can be frontbenchers in the Lok Sabha, either as part of another BJP government or in the opposition, if Narendra Modi loses the election. Both are well known for their oratorial and debating skills. One of them is Union Textiles Minister Smriti Irani, who had fought elections unsuccessfully against Kapil Sibal in Delhi’s Chandni Chowk and Rahul Gandhi in Amethi. She has been paying special attention to Amethi as she feels the development thrusts of the Modi government at the Centre and of Yogi Adityanath in Uttar Pradesh, combined with the organisational machinery of the BJP, can be bitter medicine for the Congress president. Another name which has emerged strong in the last six months is that of Defence Minister Nirmala Sitharaman, the party’s big face in parliamentary and media debates. She has not contested an election so far, but has taken on the opposition, especially Rahul Gandhi, aggressively. But, she lacks a strong local base, even though she represented two states in the Rajya Sabha. The Tamil Nadu BJP has suggested that she would be the ideal candidate for the South Chennai seat, especially if the BJP forges an alliance with the ruling AIADMK. South Chennai had favoured actress-turned politician Vyjayanthimala Bali in the past; Sitharaman’s Tamil roots would be to her advantage, the party feels. The Kerala unit of the party consider her to be the perfect fit for the equally urbane Shashi Tharoor of the Congress, who has won the Thiruvananthapuram seat twice. Tharoor was given a close fight by BJP veteran O. Rajagopal in 2014. The state unit thinks the capital city of Kerala offers the best prospect of opening the party’s first ever Lok Sabha seat from the southern state, especially if a high-profile personality like Sitharaman is fielded. It would be interesting to see who will inherit the baton held for long by Sushma.